Yesterday I got an email letter. It went a little something like this. Hi there… blah blah blaaah. I often feel the urge to eat like a trucker. Blah blah blaaaah. I always want french fries and hot dogs and meat loaf and steak. Blaah blaah blaaaaah. Today I almost ate at a place called Burgers and Pie for lunch. Blaah blaah. Instead of burgers and pie, I just dreamt up my fantasy dessert. This bring me to my point. 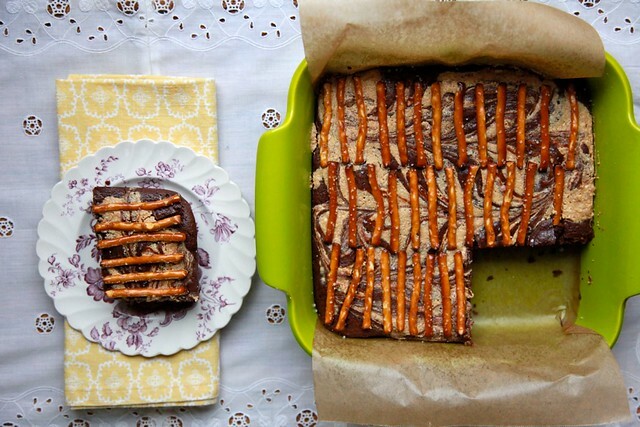 Will you please, please, please make me some peanut butter brownies with pretzels? I’ll be your best friend. Ironically, this email letter was from my real life best friend, Rachel. Rachel is prettier than me. I’m ok with that… mostly because I can’t do anything about it. Because I want to honor and maintain the best friendship between Rachel and I… I made her these brownies. Good Lordy Almighty! These might be the best thing to ever happen to me. Rachel was on to something when she dreamt up these brownies. 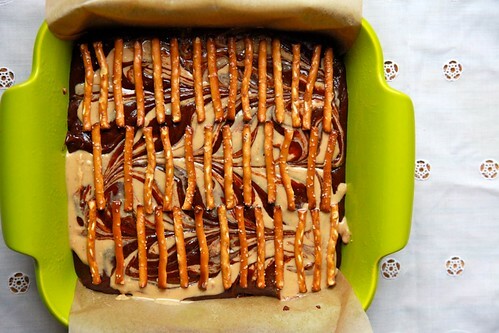 Dense chocolate fudge brownie swirled with sweet and salty peanut butter, topped with crunchy pretzel sticks and sprinkled with coarse sea salt. 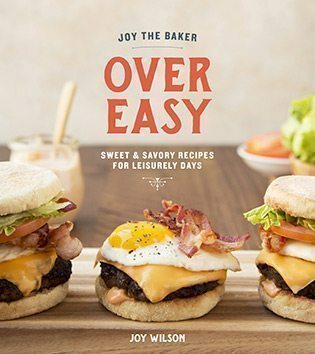 If you don’t have an instant desire to make these… I don’t know what the heck you’re doing here. Lord have mercy on our midsections. Place a rack in the upper third of the oven and preheat to 325 degrees F. Grease an 8×8-inch baking pan. Line with parchment paper so that it overhangs on two sides and grease the parchment paper as well. Boil two inches of water in a medium saucepan. Combine butter, unsweetened chocolate, semi-sweet chocolate and coffee powder in a heat proof bowl and place over the simmering water. Stir until chocolate and butter are melted. Use a pot holder to remove the bowl from the double boiler and let mixture cool slightly. Stir in the vanilla extract. Whisk granulated sugar into the chocolate and butter mixture. 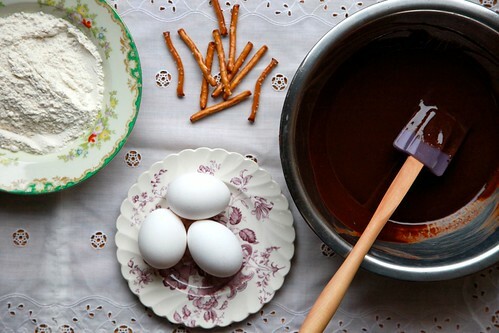 Make sure the chocolate mixture isn’t too hot and whisk the eggs in the mixture one at a time. Fold in the flour mixture into the chocolate mixture and spoon into prepared pan. To make the Peanut Butter Filling, whisk together peanut butter, melted butter, powdered sugar, salt and vanilla extract until smooth. Pour the peanut butter mixture on top of the brownie batter and use a butter knife to swirl the two together. 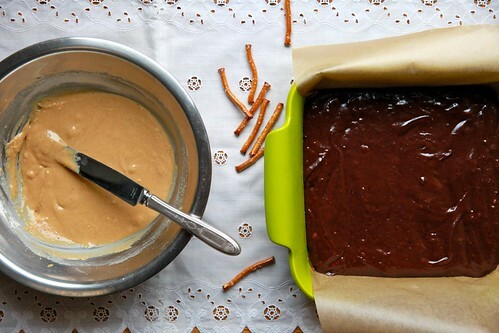 Arrange pretzel sticks on top of the brownie batter in whatever pattern makes you happy. Top with a few sprinkles of coarse sea salt. Bake for 40 to 45 minutes until a skewer inserted in the center comes our mostly clean… maybe with just a few crumbs. Let cool for about 30 minutes before slicing and enjoying. This recipe is basically just a ‘Things of Beauty’ list: sea salt, chocolate, peanut butter, coffee and savoury snackfoods. I really don’t know why it never occured to me to just take a handful of my favourite edible things and throw them into a brownie – after all, that’s usually how I come up with a new cookie. Feel free to post more of these quirky-flavour-combinantion recipes. Might I suggest something apple + peanut butter related? forgive me. but ummmm. isn’t your pretzel laying a little lazy? c’mon….imagine if you smashed up some of the st@arbuckz chocolate caramel pretzel yummness and reverse smashed it into a brownie or two. Just sayin’. Rachel is really, really lucky to have you as a best friend! Wow, what delectable creations. I really like the swirls of the peanut butter and chocolate. Sinful yet worth a try! This is the most incredible mix I’ve seen in a long time, that’s what best friends are for I guess, new ideas! Oh, dearie dearie me… I can see why you two are best friends. As if things couldn’t get any more fabulously decadent around here!….Yum. Who has the piano hands? These are tres hilarious,,,but also delish, I bet! I have a thing for Mr. Pretzel to be honest… I love him in all ways…anyways, even vertical or sideways.. I love salty sweet. This looks like a brilliant concoction. Brilliant! I love that this dream needed very little deciphering, haha. Whoa! These are genius. Of course they’re gonna be awesome–they have that added crunch. And salt. And coffee! Which is super important. i am eating one of these right now. best. best. best. ever. i still have urges to eat like a trucker. ah well. you rule. thank you. Thank you, thank you, thank you for getting Joy to make these for you, and share them with us! my pleasure! i excel at being bossy, especially when it involves peanut butter & chocolate! and i want to try them so badly!